It's Nancy Nickel here today with a new Tutti Designs share! This week I'm using the lovely "Daisy Panel Die" from the October release. Now I will show you how I made it. Using a pretty, double-sided paper, I cut the die twice. Here you see both sides of the paper; a printed side and a solid side. Here I have turned them so that the printed side faces up on both. If you look closely, you can tell that the one on the left is wrong side up. An easy way to fix this is to run a bone folder over the edges of the die-cut to smooth them out. Next, I adhered each of the die-cuts onto the solid colored paper. Setting those pieces aside, I went on to create the card base. I cut a piece of cardstock that measured 10" X 6 1/2". I scored this cardstock 2 1/2" from each end, folding towards the center. 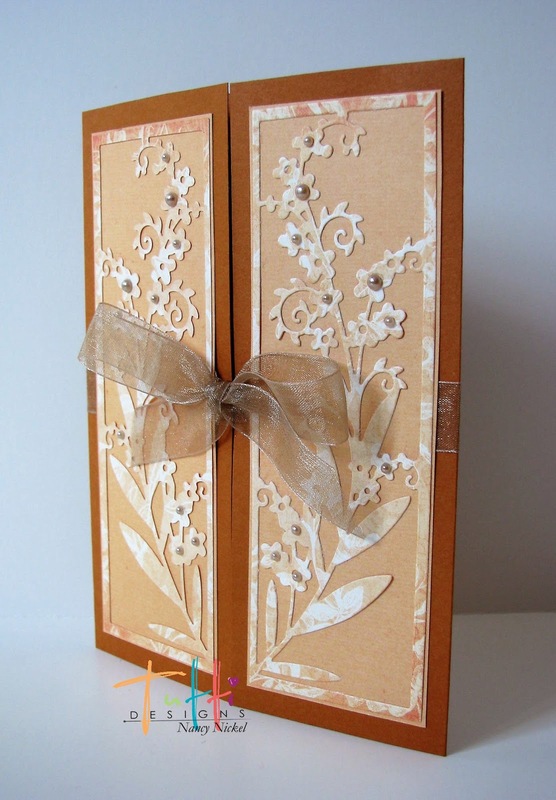 I adhered a ribbon along the middle of the card, beginning at the back, and wrapping around the front panels. All that was left was to adhere the Daisy panels to the front of the card panels, and tie the ribbon in a bow. Finally, I added a few random pearls in the centers of the flowers. 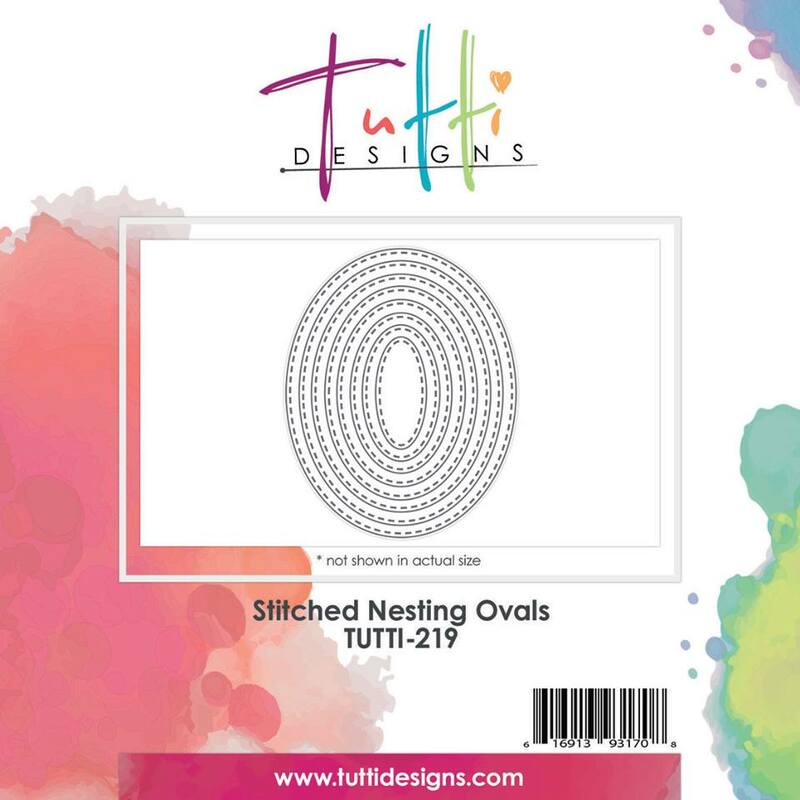 I added a Nesting Stitched Oval die-cut to the center. 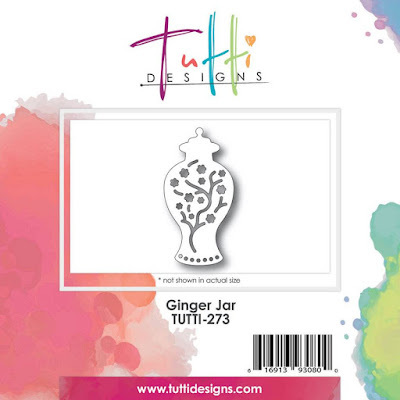 The perfect spot to stamp a sentiment and add a message! 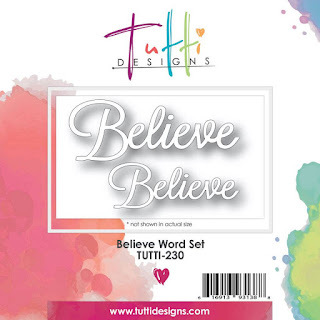 Darlene with you today sharing a card of Happiness. I wanted to make a special birthday card for a friend earlier in the month so I went directly to my Tutti dies. 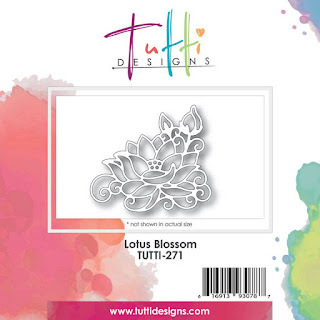 Be sure to pop over to the Tutti Designs Store for some amazing dies that will make your crafting time fun and easy! You will find several different Stitched Nesting Shaped dies in the store. 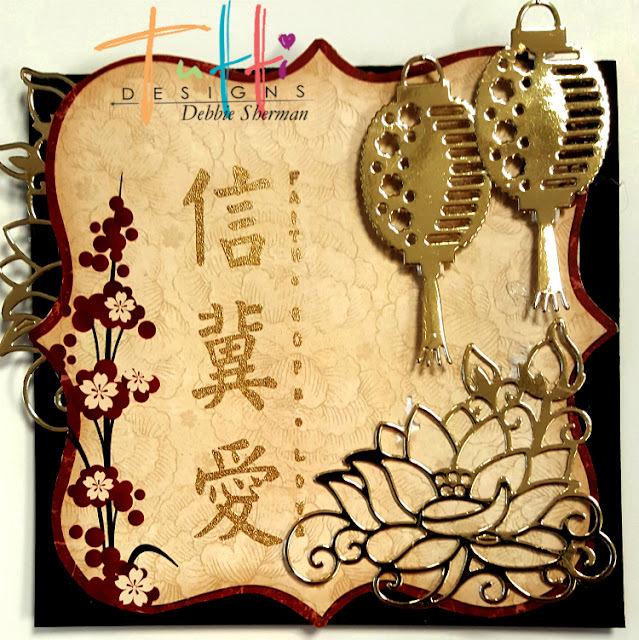 These are so very useful, you will want to have them all in your collection of dies. 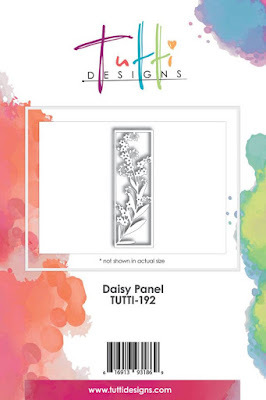 With having the various sizes, you not only get a great selection of individually sized panels but you can do as I have done today. Instead of having the added bulk of a complete matting panel ... you can die cut a frame and add it over the top of your image vs behind it. 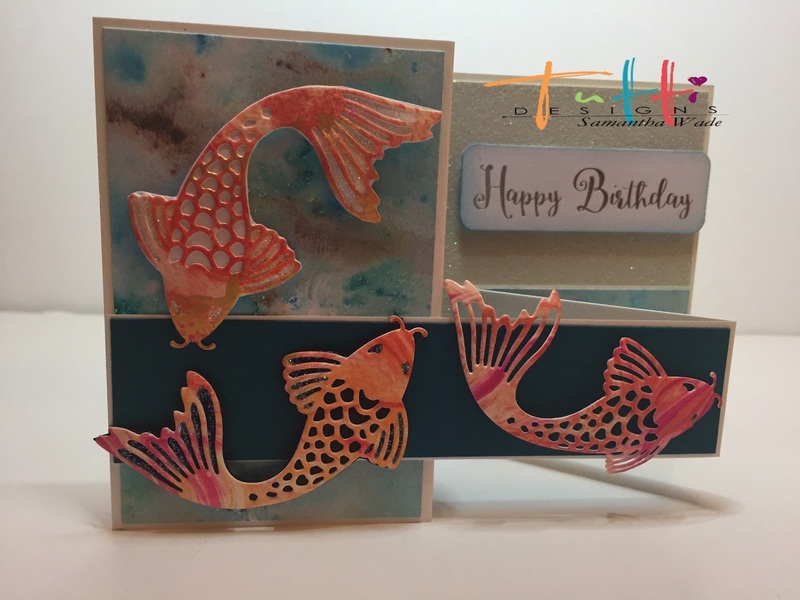 There are so many different designs you can create with just one die set!! You can let your creativity GO WILD!! 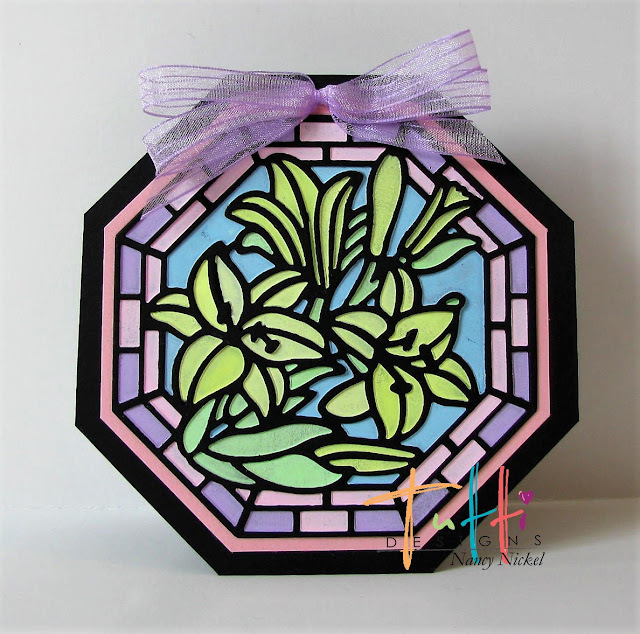 It's always fun to try and think outside the box when using these amazing dies. Thanks for stopping by and as always . . . Happy Cutting! 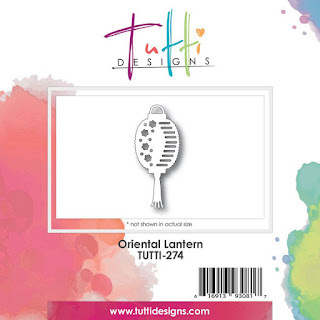 Hi Tutti fans! 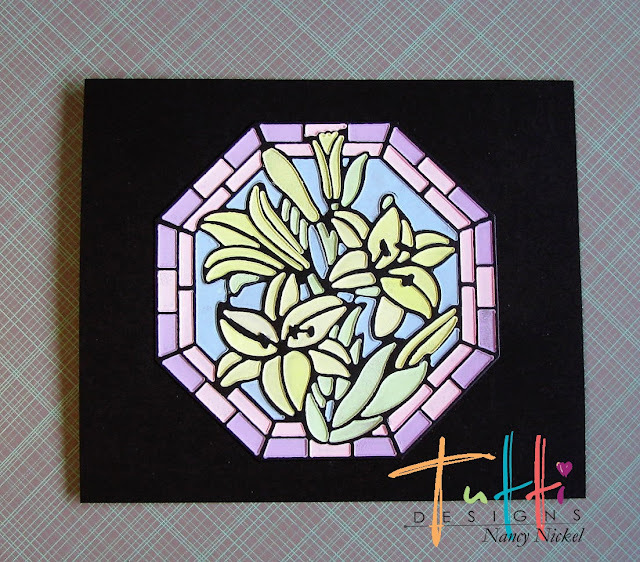 Today I am using my Tulip Corner die to create a sort of embossed background for the actual card. Instead of it being the focal point I am using it against the patterned paper to for an embossed look or even sort of added texture. Simply choose papers that are closely matched. 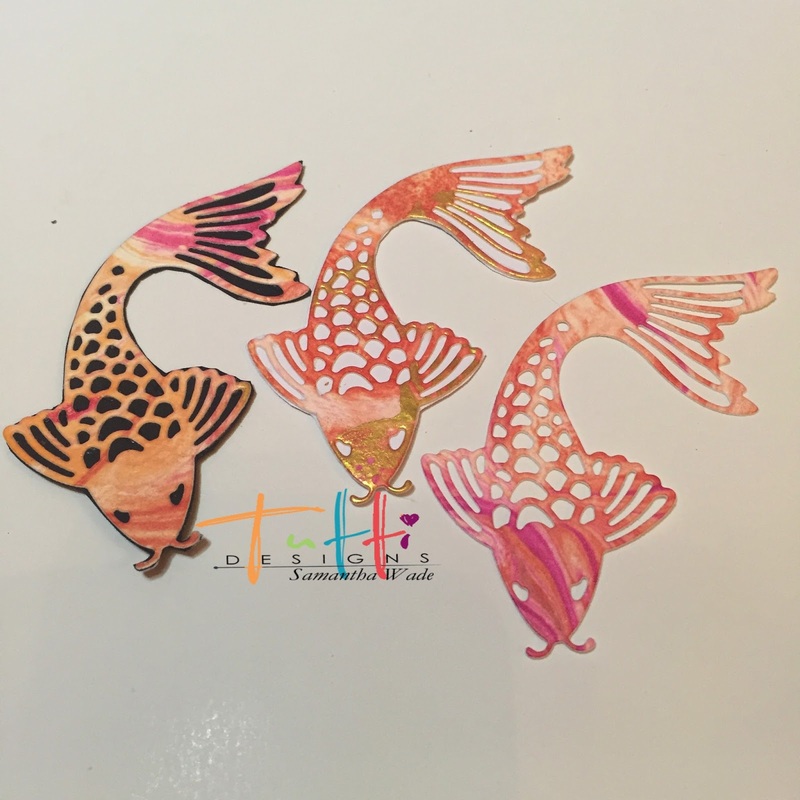 Three Fishes swimming, Beautiful Koi. 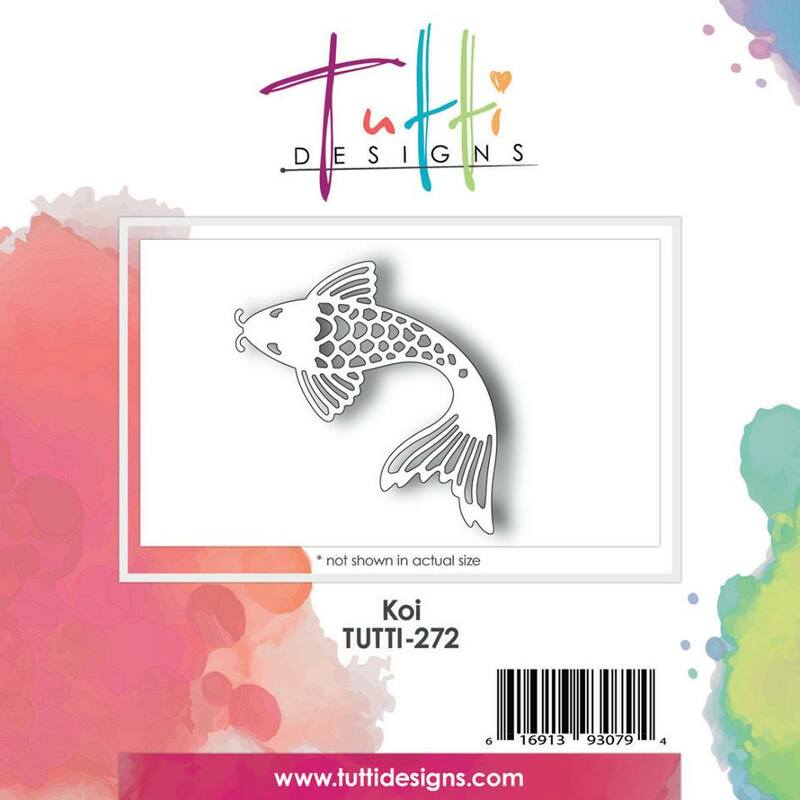 I have Koi pond with 8 beautiful fish, so was so pleased to receive this die, Love it. 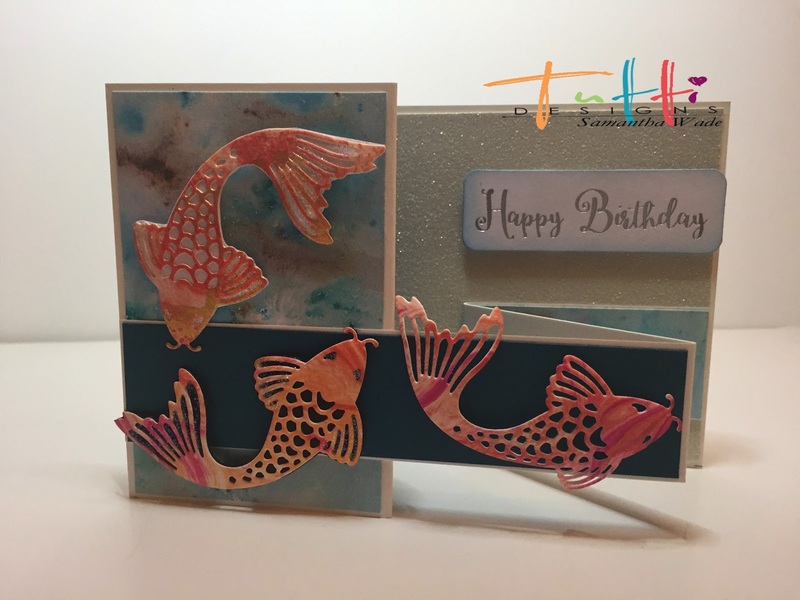 Die cut the Koi three times from patterned card. 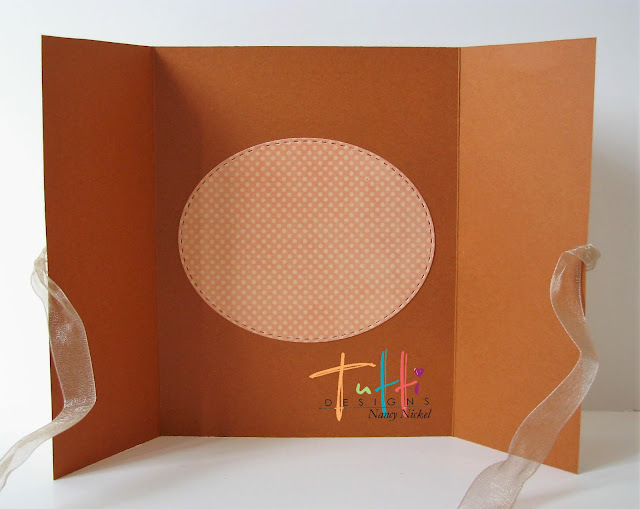 Then glue one onto black card, one onto white card and cut out. Shape each Koi with a ball tool and mat. I made a Z card and used a variety of blue papers. Used 3D foam pads to make the koi stand out. Add a sentiment to finish. 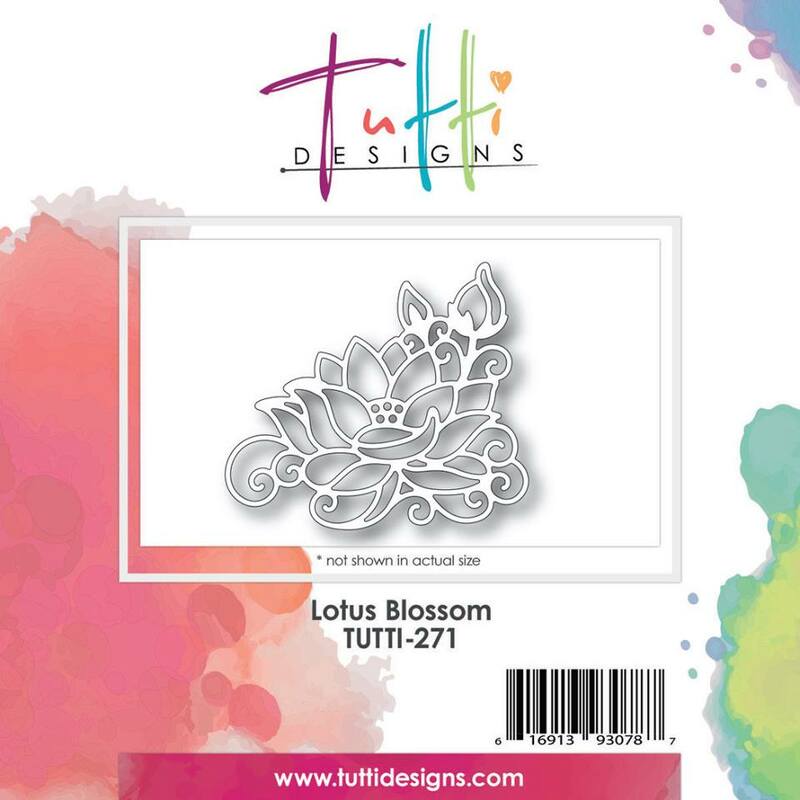 February Release of the Lotus Blossom Die and the Oriental Lantern. This card started out being a little challenge and ended up being one of my favorite cards! I actually had a rubber stamp that I forgot about and it turned out to be perfect with these beautiful dies. To make this card I used black cardstock as a base. This card measures 6x6. The paper is from my stash. (amazing what you find when you dig around) The stamp reads Faith Hope and Love. 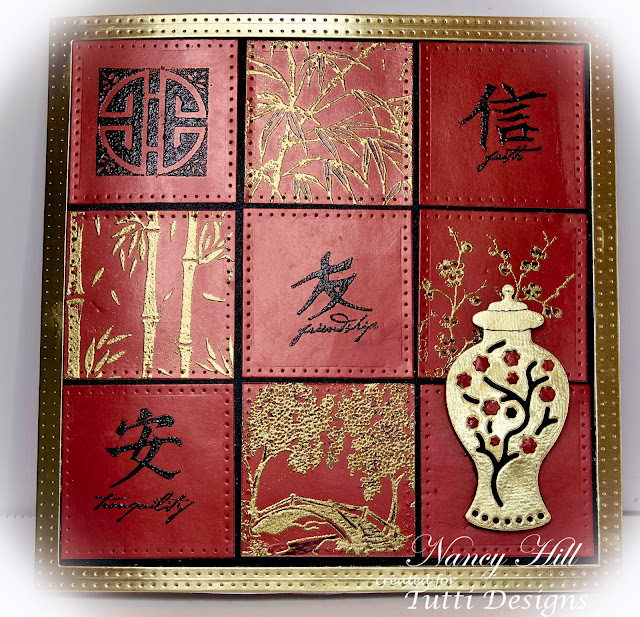 I stamped it with Versa Mark and embossed it with Gold embossing powder to match my die cuts. I used Gold foil card stock to cut my die cuts and I cut 2 of each. 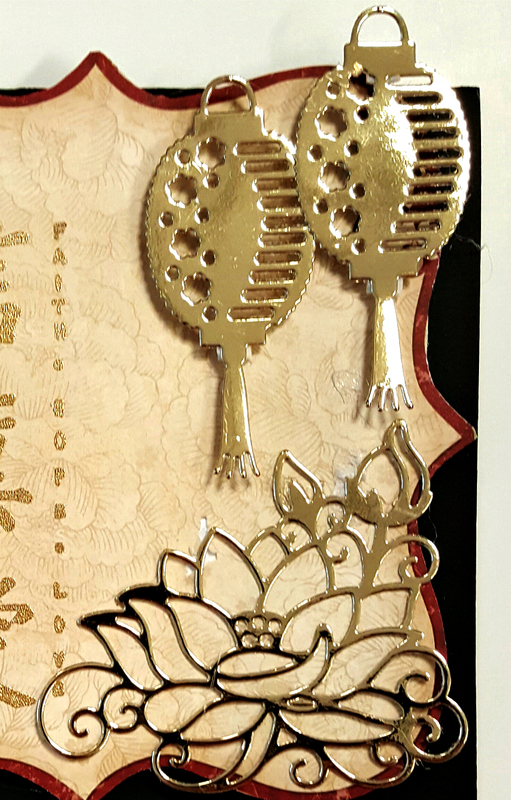 I used foam tape to adhere the main card and then tucked one of the Lotus Blossom die cuts under the card background and used it as a doily. 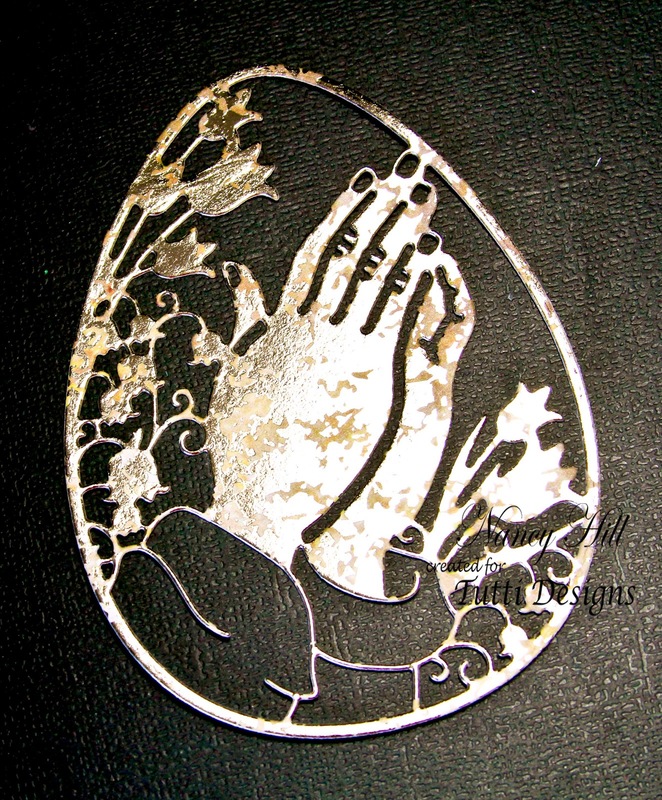 The next step is to adhere the remaining die cuts. Offset the Oriental Lantern die cuts in the corner and just below that adhere the Lotus Blossom. 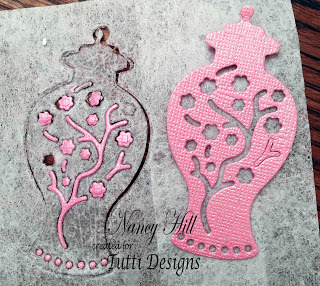 One of my favorite ways to color my die cut outs is to use Distress embossing powder. Here I inked the cutout with Versamark on my craft mat, then sprinkled on two colors of EP. I added the blue where I wanted it, then flicked off the excess and repeated with the green. 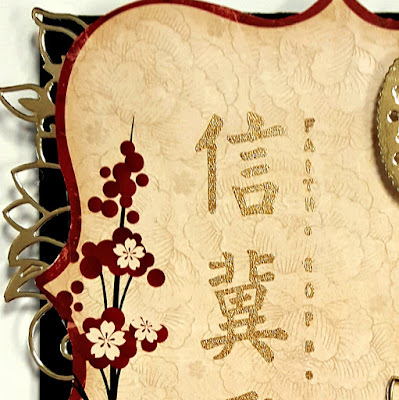 A few pearls in the flower centers and a row of tiny pearls complete the card. 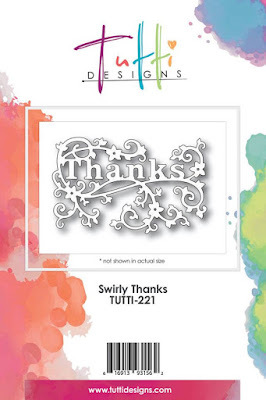 Purchase your Swirly Thanks die today HERE! Welcome back to my Tuesday's postings for Tutti Designs. Hi, I am Nancy Hill and excited to share with you the very gorgeous Tutti Designs die called Praying Hands Egg. I used the Recollection Mercury Glass card stock for the Praying Hands Egg die cut and adhered it to the card using Aleene Fast Grab Tacky adhesive spray after I had embossed the white shimmer paper using the Craft Concepts Embossing Folder Sun Rays. I used the same card stock for the outside frame and used the adhesive spray on the back of the shimmer paper to adhere to the card. 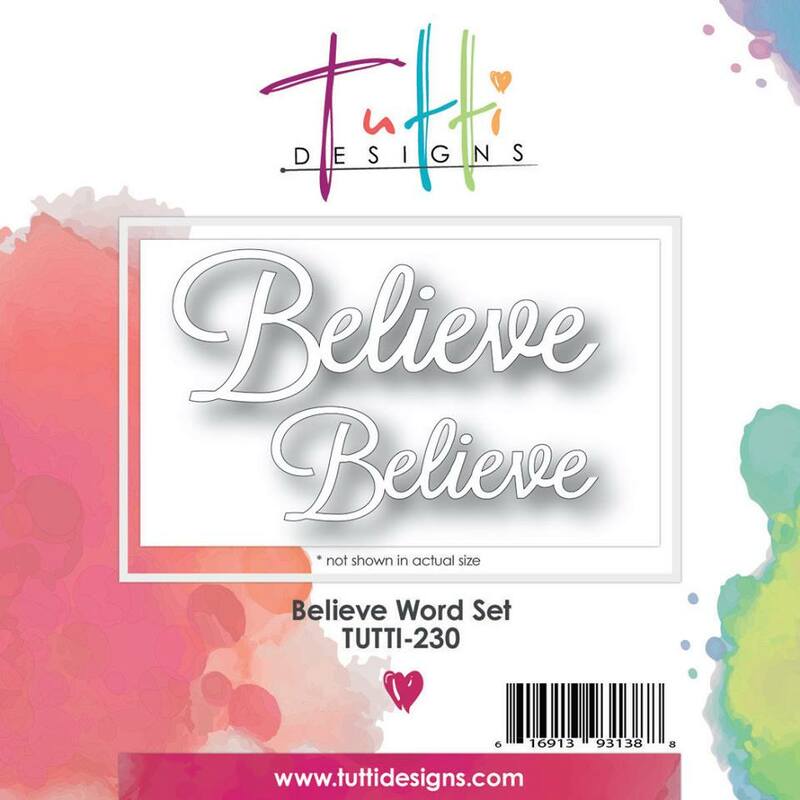 I used the adhesive spray for the Tutti Designs Word Set Believe large die to the card (Each of the Tutti Designs Word sets have two sizes). Afterwards, I always add flowers to my cards. It's Nancy Nickel back today with a new Tutti Designs share! Then I adhered the die onto another piece of black cardstock. I was excited to use my brand new Sakura Souffle Pens. Next, I just went about coloring. This was very easy to do, since each bit was framed with the die-cut. To finish it off, I cut the die again out of black cardstock. I adhered this one directly on top of the colored piece. It just crisped up all the edges, and added a bit more dimension. Now it was time to create the card. I trimmed around the colored piece right along the edge of the die. I placed it on pink cardstock and trimmed it leaving about 1/8" around. 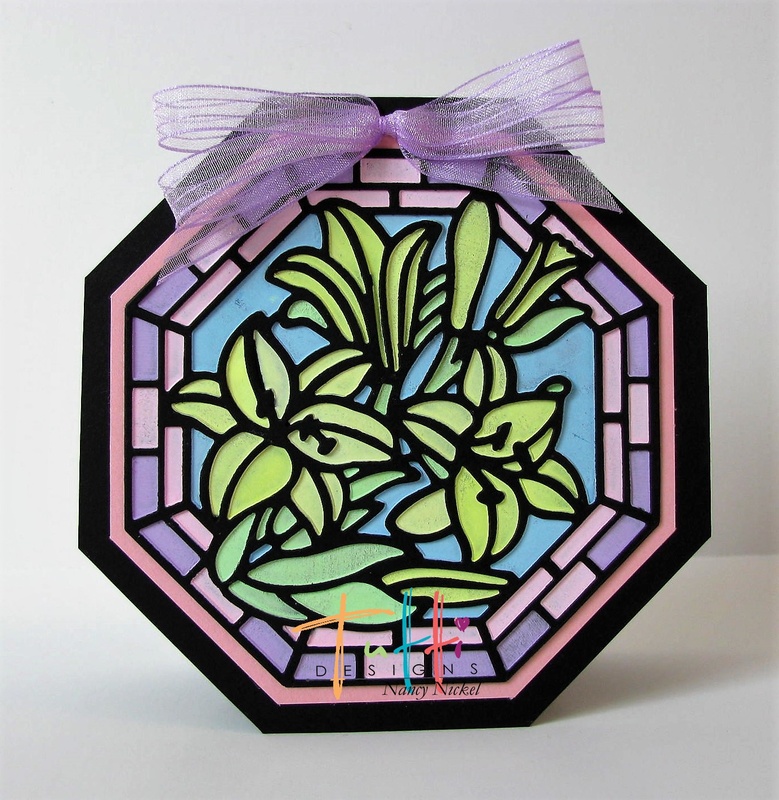 Then I did the same again by placing it on a black card base. This time I trimmed it leaving 1/4" around, with the fold at the top. Finally, I added a pretty ribbon bow. Darlene with you today sharing a card of Sympathy. 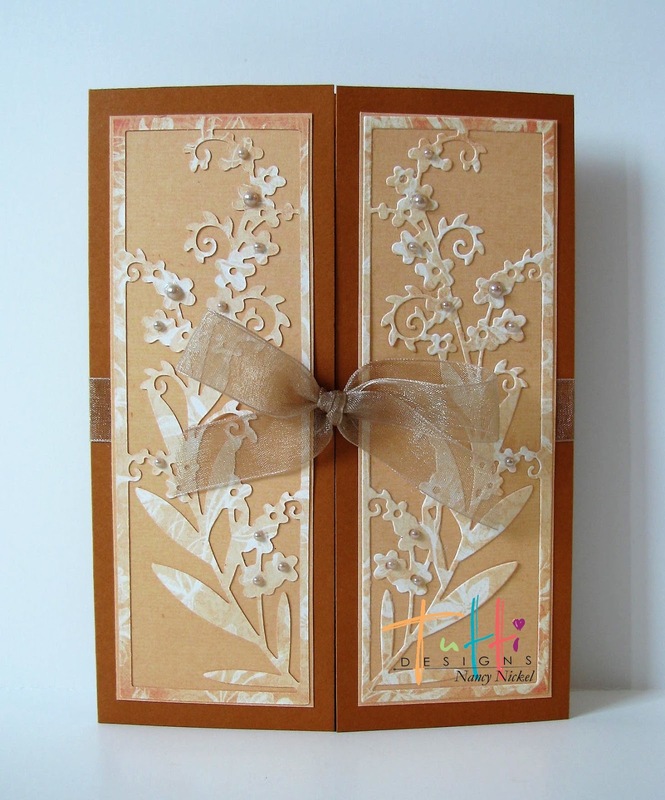 Sadly I find I'm in need of sympathy cards more and more as the years go by. 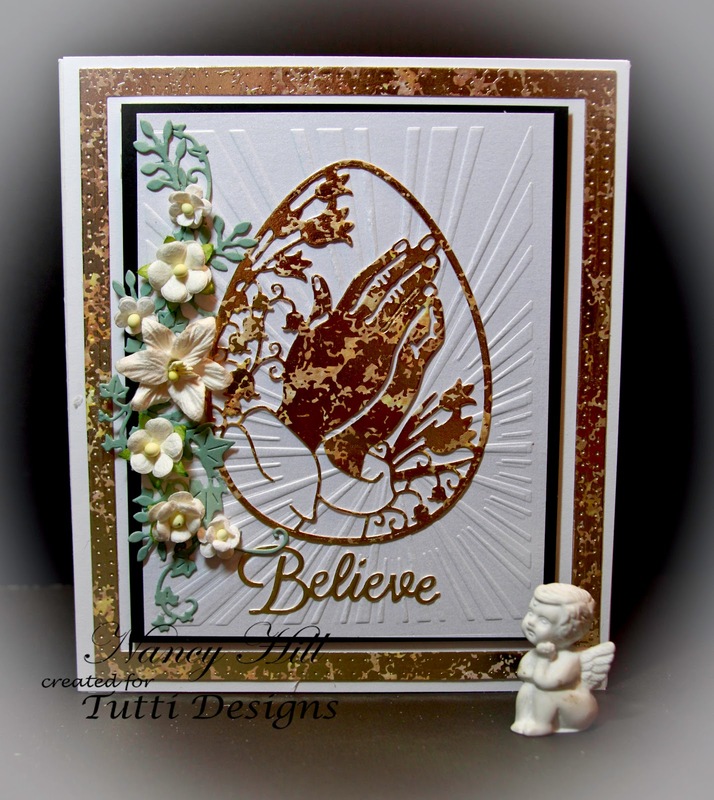 Using a couple of the beautiful dies available at the Tutti Designs Store, I can create a sympathy card and have it in the mail all on the same day when the need arises. 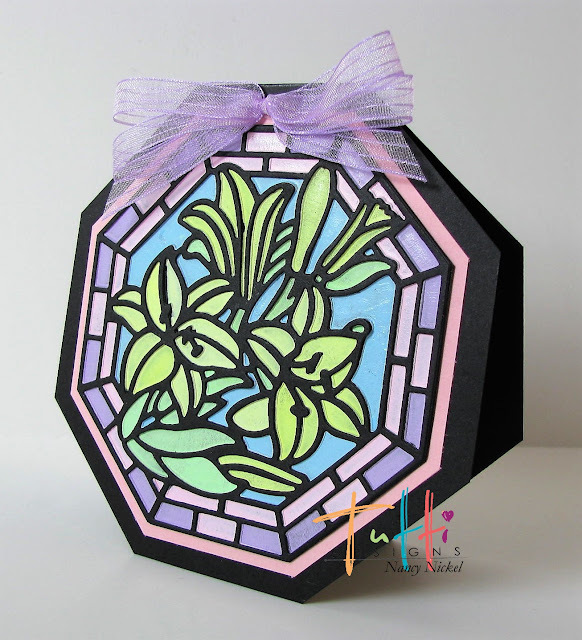 I didn't do anything 'special' on today's card other than add a little color sponging to the flowers and the center cross. Since this lady really liked a touch of sparkle in her life, I felt it was appropriate to add a little touch of sparkle using Nuvo crystal drops to this creation. Easter Gate ... Come on in! 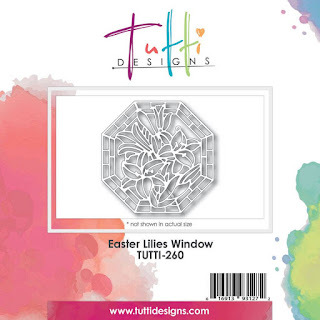 Tutti Easter Tulips with spring wishes. 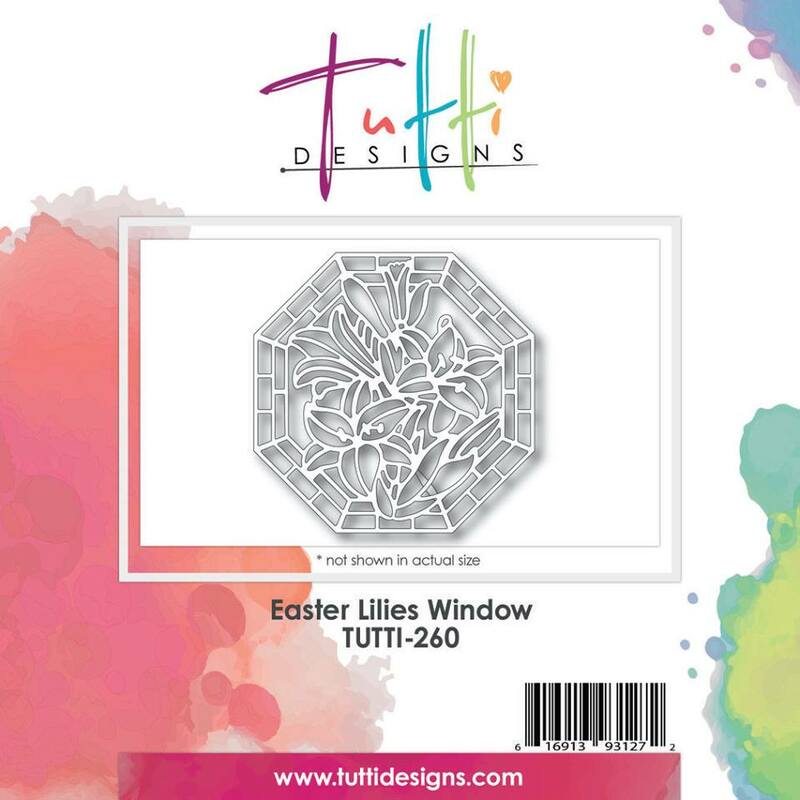 A Tutti Designs Easter Egg thats calorie free.